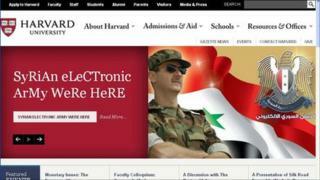 Image caption Harvard's website carried a message from the "Syrian Electronic Army"
Harvard University has had its website hacked in what appears to be a "sophisticated" Syrian-related attack. Along with a picture of Syrian president, Bashar al-Assad, the hacked home page showed a message saying the "Syrian Electronic Army Were Here". A further message made terror threats against the United States and criticised its opposition to the Assad regime. Harvard said this has been the work of a "sophisticated individual or group". "The university's homepage was compromised by an outside party this morning. We took down the site for several hours in order to restore it. The attack appears to have been the work of a sophisticated individual or group," said a Harvard spokesman. The website was hacked on Monday morning by what appeared to be sympathisers of President Assad of Syria, with a picture of the president in military uniform appearing in front of a Syrian flag. This was linked to another image of Syrian national colours, with a message accusing the United States of involvement in the uprisings against President Assad. It told readers: "This site has been breached to spread our message even if illegally." The message, claimed on this webpage as coming from the Syrian Cyber Army, accused the United States of supporting a "policy of killing" in Syria. In fragmented English, it also carried a threat of violent attack. A Harvard spokesman suggested there had been a pattern of a growing number of such electronic attacks.